Praise in public; criticize in private — that’s a basic thumb rule that will help you keep your employees motivated and happy at their workplace! As a startup founder and an employer, it’s of critical importance that your teams remain engaged and love their job; work engagement leads to a dramatic increase in productivity and ensures you retain your pool of talent and we have seen this for real at our company Alore ! Its imperative to keep the morale levels running high by lavishing praise for clever work and providing positive, constructive criticism for tasks that could have been done better. Appreciation is a huge motivating force and your employees will thrive on the positive recognition. 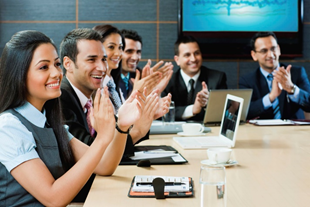 When you applaud a colleague or subordinate in a group meeting or public domain, everyone present will gain learning and be propelled to enhance their performance. The employees who witness a colleague being praised will subconsciously register the environment around being positive and nurturing and motivate them to follow suit. Employees feel respected and valued for the contribution they are making towards achieving organisational goals and it’s a powerful message to the everybody that good work is noticed. Managers need to identify the right opportunities where they can make a mark by showering praise on star workers. Public applause reinforces correct actions and praising desired behavior will lead to a repetition, thereby massively enhancing job performance. Social niceties are a huge plus in a professional environment. A sincere compliment, a pat on the back, a thank-you and a saying please make an employee feel respected. If there is possibility of introducing and honoring employees with work-titles like “employee of the week “or “star of the month” — please do so! — This will go a long way in keeping your team of workers engaged at the workplace. So, don’t shy away from public ovation and make your employees know that they are the foundation of your business success. Employers need to keep a check on their employees work performance, and when it’s not up to mark, they often need to give candid feedback, counsel and provide direction. Criticizing your workforce in public is a morale dampener and leads to embarrassment in front of colleagues. It’s important for managers to realize that the way they deliver criticism can have a tremendous impact on employee well- being. If an employee is shouted or insulted in public, it is likely to trigger off internal defense mechanisms leading to confrontations or disengagement. 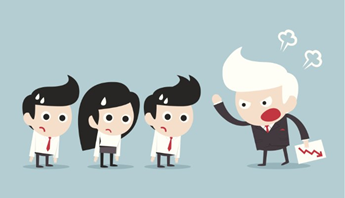 Trying to publicly set an example by chastising an employee is bullying. PERIOD. It is more detrimental to the culture of a company than you can imagine or envision. It’s been proven via research that colleagues who witness one of them being chastised publicly, subconsciously register the environment as negative, are likely to be more apprehensive and less likely to come forth with innovative ideas or out of the box thinking for the fear of being reprimanded or shamed. Toxic bosses need to be weeded out or counselled to handle their colleagues and subordinates better. Under no circumstances is it acceptable or okay to rationalize a manager demeaning a colleague or subordinate publicly. ALWAYS communicate in private at a secure place and cultivate a discussion by promoting two-way communication. Try to be a solution seeker rather than condemning workers harshly without providing effective coaching. Make sure your workers know when they have made a mistake, help them accept it positively and make the necessary amends in behavior that will lead to enhanced job productivity. In case of startups, with longer working hours and young teams, the environment is fast paced more charged generally. Colleagues and subordinates are more likely to display their passion and emotion with a happy dance or occasional outburst. As a founder I try to ensure that my team understands that it’s okay to feel frustrated or excited and we all cross that bridge at some point of time. However, under no circumstances do we ever be disrespectful towards each other publicly. If ever there are differences, I encourage to sort them out one to one in a singular polite conversation. We party on weekends and Friday evenings are times to unwind over drinks and chit chat to keep the hierarchy horizontal and have a feeling of accessibility across. Employees everywhere — from startups to big conglomerates, can never get enough of praise so make sure you are liberal in making them feel a valuable organisational asset. Foster collaboration between your staff and enhance efficiency by linking recognition initiatives with performance goals. Remember, the key to a smart and happy workforce is great leadership which harnesses talent. Please click here to read more such articles.